Sometimes, when I am sitting in an easy chair, with only a cigar and my thoughts for companions, I am reminded of a little magical problem that I have often tried to solve. I want to do on the stage just what I am then doing in my study, but of course, something else is to happen. The trick will really begin – if ever I succeed in solving this puzzle – when the smoke from my cigar collects in a little cloud and remains a few feet above my head. And as I sit there, smoking and trying to convince the audience that I am thinking, the little cloud of smoke will drift slightly and, in moving, will gradually form itself into a kind of “smoke statue” of a woman. 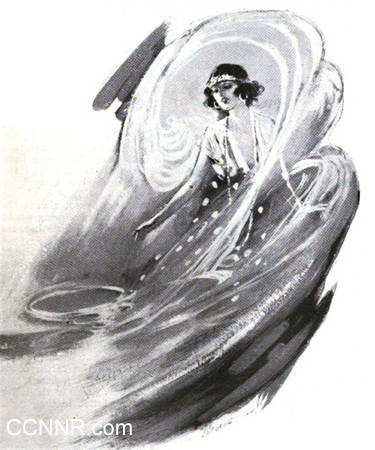 The smoke will slowly disperse, and the audience will then see a woman floating in mid-air; she will show by her expression and movements of the hands and head that she is a living being. When the audience have been convinced that the woman is really a living being I shall put down my cigar, stand up, and look rather incredulously at the figure for a few seconds. The figure will then dissolve into a cloud of smoke which will disperse and disappear altogether. I shall return to my easy chair and my cigar, and the curtain will fall slowly. This is not an “impossible” illusion by any means, but I have not yet hit upon a method which appeals to me. This illusion reminds me of another which is rather more difficult. I imagine that everyone has seen the illusion in which a woman, reclining on a couch on the stage, floats away from the couch and up above the head of the performer. The magician passes a solid hoop over the figure to prove that the woman is quite isolated (and, in passing, I may say that the hoop is exactly what it is claimed to be – a solid steel hoop). After a few moments the figure slowly sinks down again to the couch. This is a very effective illusion, but just a little hackneyed nowadays. I have always thought, however, that the fact that the illusion was presented entirely on the stage seemed to rob it of some of its effect. How much better it would be, I think, if the figure, after rising in mid-air, slowly floated away from the stage and passed over the heads of the audience and returned to the stage. Here, again, we have an illusion which is not impossible, but I have not yet discovered a way out of certain difficulties. An illusion or trick which seems to be very complicated is not always the most difficult for the performer; on the other hand a plain, apparently simple little trick, can be very bothersome. Here is an idea which was given to me by a pupil of mine. It seems simple enough, but though I have known of it for years I have not been able to find a good way of doing the trick. We will suppose that the reply is : “Two separate shillings and a sixpence.” The conjurer immediately opens his hand and shows two separate shillings and a sixpence. If the conjurer knew that he was going to be asked for that change the trick would be fairly easy, but that is not the trick. The performer has to be ready to give any change in silver without opening his hand until the end of the trick. My pupil kindly suggested that to make the trick “really difficult” we ought to allow the owner of the half-crown to choose part of his change or all of it in coppers, but I gave an emphatic “No” to that idea. Imagine what would happen if some sweet child of nine, after a little calculation, prompted the owner of the money to ask for a hundred and twenty farthings! No, the trick is quite difficult enough if you limit the choice to silver, and partly because it is difficult it remains among the tricks I want to do. Here is another little effect which seems absurdly simple – till you try to do it. The conjurer has a blotting-pad, some paper, pens, and ink. He asks someone to come up to his table, select a pen, and write anything he pleases in ink. The conjurer holds the paper so that everyone in the audience can see it, and asks his volunteer assistant to hold the blotting-pad in a similar position. The conjurer then blots the writing on the pad, but when he removes the paper the audience see that the writing on the blotting-paper is not reversed – as, of course, it should be. It seems to me that the only way of doing this would be by secretly detaching the sheet of blotting-paper from the pad and turning it over, but how to do this without letting the audience see you do it – to say nothing of the assistant who is holding the blotting-pad – is beyond me at present. The trick appeals to me because it is quite different from any other trick with which I am acquainted. Let us return to the big stage for a moment, I come on with a magic wand (I have never used one) and a small handkerchief. I place the handkerchief on the end of the wand and start to twirl it round. The handkerchief spins on the end of the wand. The audience see that the handkerchief gets larger and larger until finally it becomes a huge sheet, practically concealing me from the audience, although the very sharp people in the front rows of the stalls will notice that my feet are still on the stage. 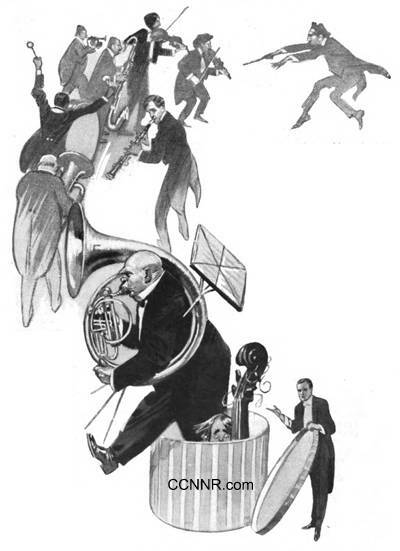 Somebody fires a pistol; there is a crash of cymbals from the orchestra; the revolving sheet disappears in a flash, disclosing four swing-boats. The audience then see that the wand which I used in the first place is now a stout rod of iron and serves as the axis on which the four swing-boats revolve. There are to be two persons in each boat and the whole structure is to be brilliantly illuminated. I once worked this out – on paper – and I believe my scheme would answer, but there are two difficulties which I cannot get over. The expense of making the apparatus would be small in comparison with the expense of carrying it about the country and paying the small army of assistants who would be required to work it. The other difficulty is the time which would be occupied in setting and striking the illusion; that difficulty is insuperable unless you make the illusion the first item on the programme, and I should strongly object to that idea. I once mentioned this idea to a pupil of mine. He suggested that for the first little effect – spinning the handkerchief on the end of the wand – I might have a pin on the wand – just to make it easy. I thanked him and asked him to continue with his solution. The handkerchief is to get bigger while it is in motion. . . . He is still thinking about it. And, as a matter of fact, that is the chief difficulty in working out the illusion. Another pretty illusion which I want to do is down in my notebook as “The Bubble.” A large bubble floats on the stage; if you think this would be too easy you can begin by blowing the bubble from a pipe. After a few moments the audience see the picture of a woman on the bubble, which sinks down on to the table and bursts, disclosing the woman standing on the table. This is rather a “teaser,” and so is the sequel. The woman is dressed in a plain white frock. At my suggestion she walks down to the audience, and two or three ladies are asked to inspect her white dress and to satisfy themselves that there is no trickery about it. 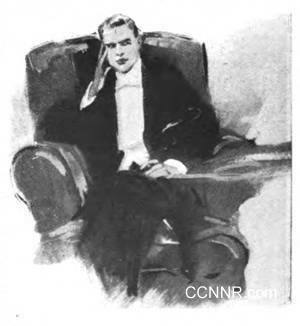 The woman returns to the stage and lies on a couch. I then ask the audience to name any of the colours which they saw on the bubble – in short, any colour they like. I ask them to watch the white dress on my assistant; the dress slowly becomes dyed with the colour the audience have chosen, and to satisfy the audience that the effect is not produced by coloured lights the assistant walks down to the auditorium again. Quite a pretty illusion – if I could do it. And I have not got very far with another little trick. I want to borrow some rings – ordinary finger rings – from members of the audience and put them in a glass, take them out of the glass and show them all linked together. Then they are to be unlinked and returned to their owners. Here is a little idea which forms part of a trick. I have not yet decided on the complete effect, but, roughly, this is the part which forms the stumbling-block at present. In the course of the trick I have to use an empty cup. A cup is on the table and in the centre of the table there is a tall glass vase. When I am about to use the cup I pretend to be surprised to find that it is full of water. I pour the water into the vase and put the cup down again. Later on I want to use “this empty cup,” but it is not empty; it is again full of water, although there is apparently no way of getting water into the cup except by pouring it in in the usual way. I empty the cup into the vase and start the trick again, and again I find the cup full of water, which I pour into the vase. The effect is repeated for just as long as the audience will stand it – or until the vase is full of water. Finally, I decide that I will do the trick some other way, and I call an assistant and ask him to clear away the things from the table, but just as he is about to pick the things up they clear themselves away by – and there my notes stop. The most difficult trick is not always the most effective. I think the following would be difficult and not very effective because the end would be too long. I have a number of cards about the size of a double sheet of note-paper and some blue pencils. I also have a very large letter file, which I hand out to anyone in the audience for a moment, so that everyone may be convinced that the file is empty. I then ask several members of the audience to write any one letter of the alphabet on each of the large cards, using the blue pencils for the purpose so that the audience may see the letters. I then take the cards, cover them with a handkerchief for a moment, and cause them to disappear. I go to the letter case, and the cards are found in their right places there. After the first card had been shown the audience would naturally guess that all the other cards were in their right places, and so you would have a wearisome repetition of the same effect, and for that reason the trick, which would be very difficult, does not quite please me. At the same time I want to do it because I feel sure that when once I had got on the track with the right method I should find a way to bring the trick to a sudden climax. In thinking out a trick you generally find that it is something like a jigsaw puzzle. When you have got two little bits done you generally see a way of joining them and making them one big bit, and then the rest comes to you. I take a large sheet of stiff paper, twist it into a cone-shaped bag, and produce a large silver ball, completely filling the bag. I take it out and it drops on the stage; it is obviously quite solid. I repeat the effect many times, until there is a pile of solid balls (not solid silver!) on the stage, all produced from the paper bag. At the end I untwist the bag and show the plain sheet of paper again. An exceptionally good orchestra at a music-hall unconsciously suggested an illusion to me. I was waiting for the curtain to rise one evening and thinking that my opening music seemed to be much better than usual when it occurred to me I might make a different entrance altogether. I would dispense with all music, would do without the customary “chord on.” When I was in the middle of the stage I would apologize for the absence of the band and ask an assistant if he had seen the lost band. The assistant would reply by handing me a large box. But it would not be a meaningless joke because I should take off the lid, and out would come the missing band in a procession, with their music and music stands, all of them ready to take their places in the orchestra, even down to – or up to – the player of the double-bass. I imagine that his instrument would give me some little trouble, but I am sure it would be worthwhile. I should have an illusion which people would wish to see more than once. Of all the illusions which I ever feel I should much like to do I think my favourite is one which was suggested to me by hearing of a dream within a dream; a man dreamt that he was dreaming. I wish to present an illusion – or, rather, a series of tricks and illusions – which will serve as a kind of frame for my customary performance. And then the table ought to obey, and another, laden with the apparatus, all magically produced for the next trick, should take its place. That would be an ideal way for presenting a conjuring performance, but I fear that it is never likely to be my way. A friend to whom I have shown this article kindly suggests that at the conclusion of the performance all the apparatus and “props” I have used should disappear, leaving me, as I started, standing on a bare stage. Perhaps when I know how to begin a performance of this kind I may discover a really good way of bringing it to that conclusion.